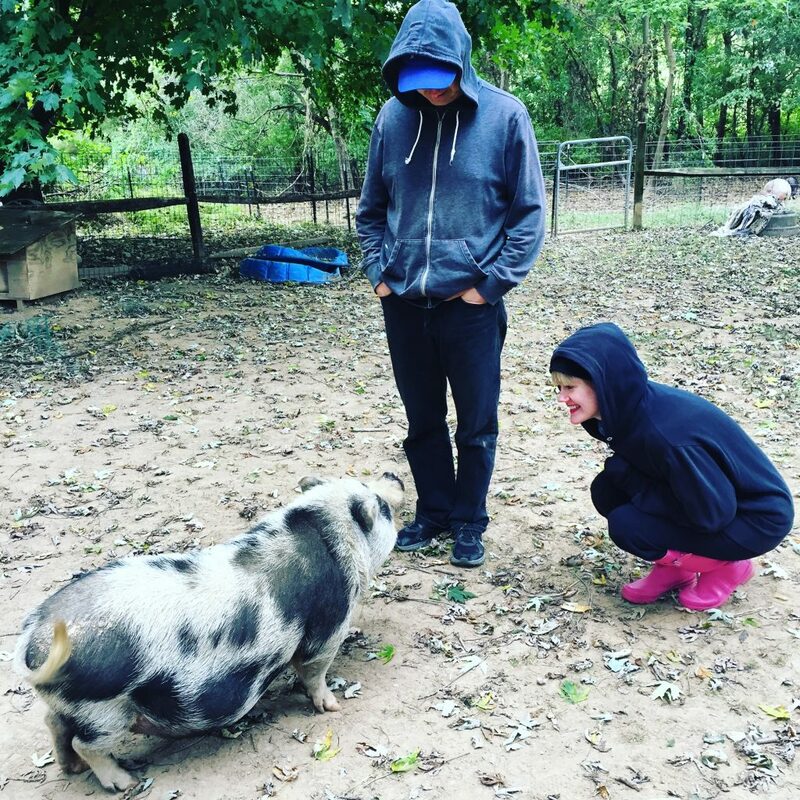 After an hour and half drive from DC, Tim and I returned to Whispering Rise Farm & Animal Sanctuary for a yoga and volunteer experience one crisp fall day late September. While I did yoga with potbelly pigs wandering about, Tim biked around the area. 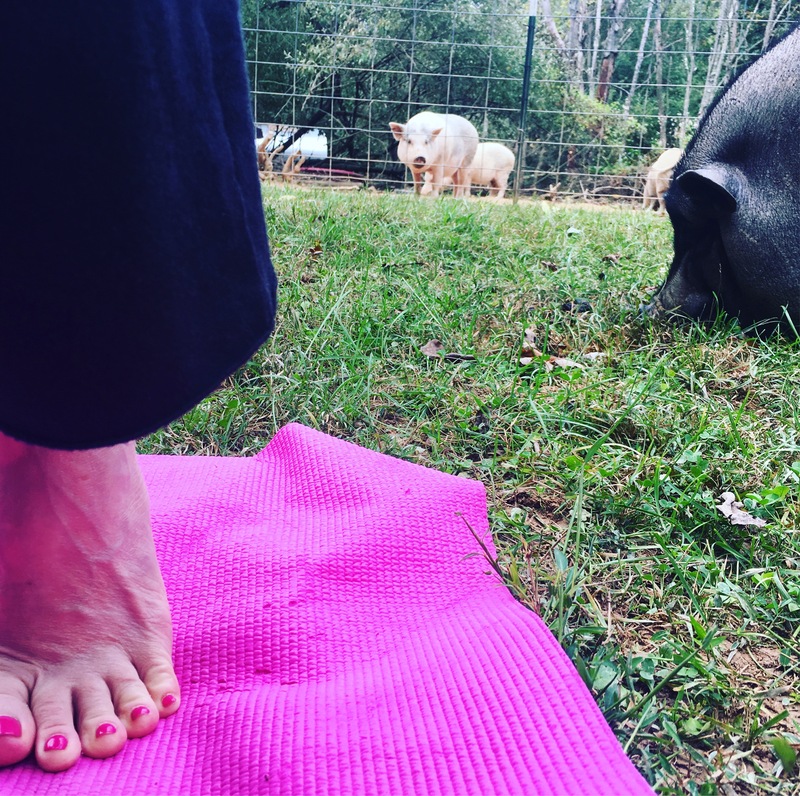 Truthfully, I was so distracted with petting the pigs and snapping photos that the yoga practice was secondary to the experience (see first pic). Next was a tasty vegan lunch followed by volunteer time. We chose one of the many tasks needed by the sanctuary owner, Jeff. Tim and I took on the glamorous job of cleaning out the straw in the aluminum pig houses set about the property. With pitchforks and brooms in hand, we headed to our first huts to pull out all the old straw. 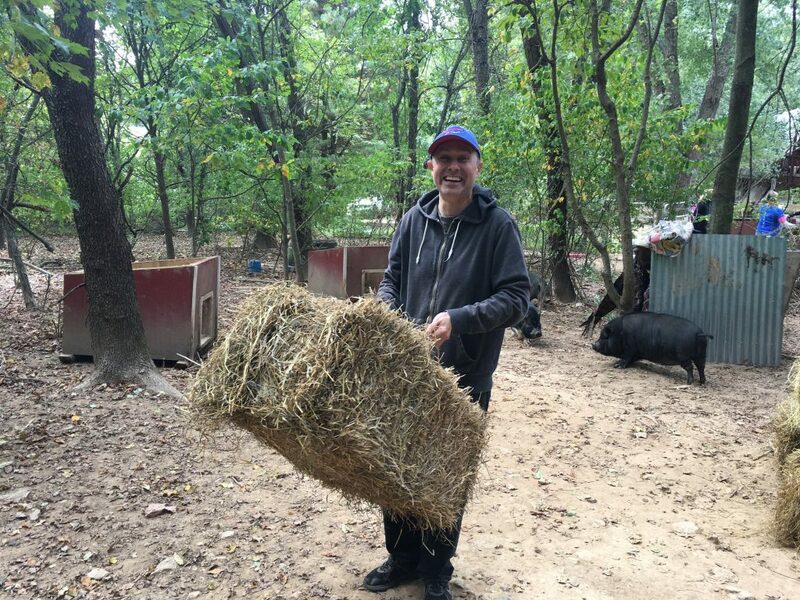 The pigs had pulled in lots of twigs and branches so we hauled that out, too. Then we hauled fresh bales to the huts, broke them open, and sprinkled the straw inside. After a couple hours of this, we were at our last hut. In the second to final photo you’ll see me trying to lure out a senior pig with food so that I could freshen up her straw. She wasn’t having it. In the final photo, we’re saying hello to Hank—the first potbelly we met during our last visit. Supporting the sanctuary through Pigs & Pugs Project donations and volunteering has been a real treat. We look forward to returning! Last month we donated $45 to support the spay of Millie, a potbelly pig activist who, along with her sisters, is hitting college campuses this fall. 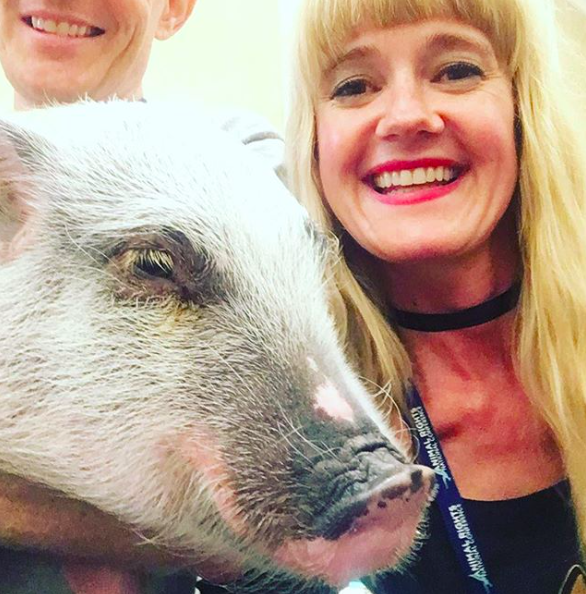 I met her step sibling Charlotte (see below) at the Animal Rights Conference early August and may have fallen in love—as did all the attendees! Pigs such as Lilou the therapy pig at SFO, Millie, and her sisters Pumpkin and Charlotte are out and about sharing their sweet spirits with the world. We’re happy to support the work of introducing others to the magic of pigs. Last Saturday Tim and I set the alarm for an early morning departure to Whispering Rise Animal Sanctuary in Freeland, MD—a few miles from the PA border. It was their monthly Pig Socialization Day and I couldn’t have been more excited! We arrived right at the 10am start time with carrots, apples, and eggplants. Jeff, the owner, greeted us warmly and Hank (in the middle) was our first new friend. 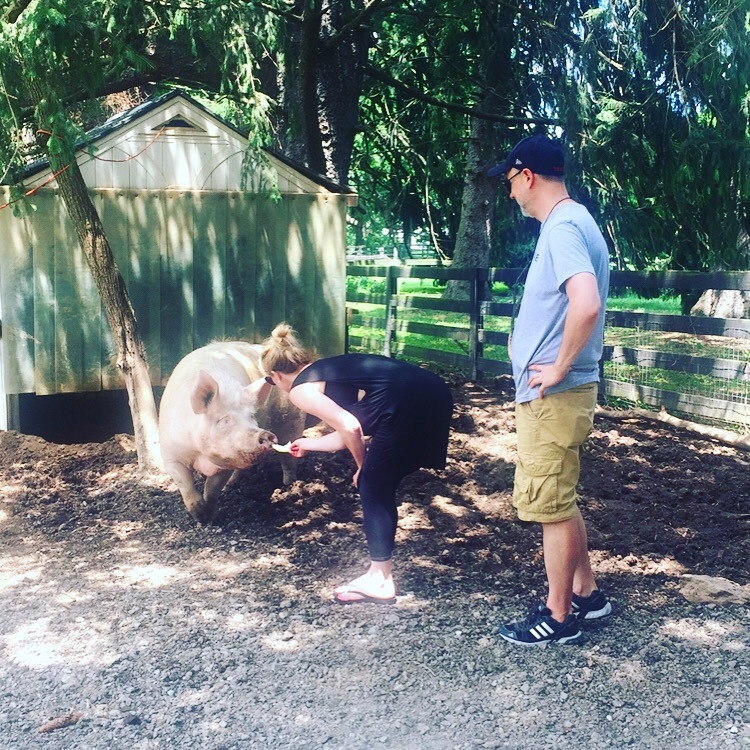 Tim and I spent the next three hours meandering among the various herds of 62 potbelly pigs with buckets full of veggies and bagels. When the pigs would drop and roll over, we knew it was time for a belly rub! 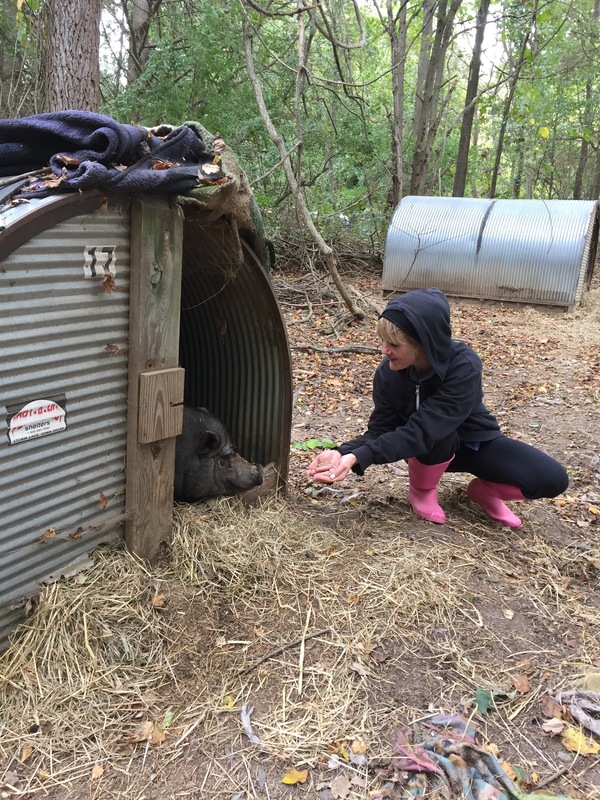 Whispering Rise’s mission is to provide sanctuary to surrendered, abandoned, or seized potbelly pigs who are products of the pet pig trade. Their secondary mission is to provide humane education to the public and to offer an anthrozoological experience to individuals and small groups. We’re delighted to provide a grant of $250 to Whispering Rise’s amazing work and can’t wait to return on September 30 for Yoga, Vegan Lunch, and Volunteering! You can learn more about Whispering Rise’s offerings on their Facebook page and about the reality of micro pigs here. Meet adorable Hank. 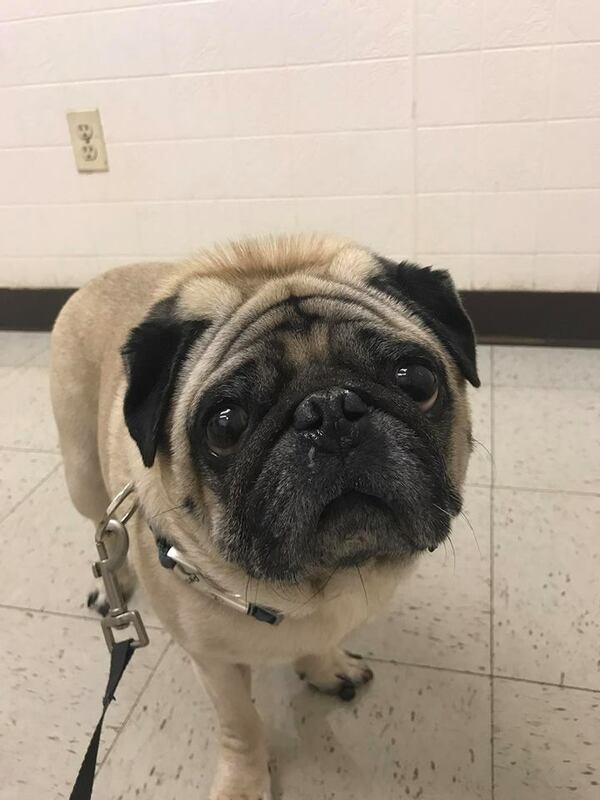 He came to Mid-Atlantic Pug Rescue mid-July as an owner surrender and recently had surgery to remove a stone lodged in his urethra. Unfortunately, the stone had been there awhile so there was scar tissue which made the surgery more involved and he now needs another surgery to get neutered. We’re sending Hank, the vet, and his caretakers lots of love and are honored to be an “Angel” in his support network through our $100 donation. Please consider supporting the work of Mid-Atlantic Pug Rescue and follow Hank’s journey on their website. Adopt, don’t shop and please spay and neuter. On Saturday we gathered at Burleigh Manor Animal Sanctuary for our second annual Yoga + the Animals event. The day began with iced mint tea and vegan treats followed by a private tour of the sanctuary. We met goats, sheep, a cow, horses, mules, pigs, turkeys, chickens, geese, and donkeys. Next we rolled out our mats on the green grass under a huge tree and I led an all-level practice. Fellow teacher Courtney Hatten gave hands-on assists. We were enveloped with a gentle breeze and the sounds of the sanctuary (especially Greta the chatty goose). To complete the experience, we dined on a tasty vegan cous cous salad and melon balls created by Tim Mooney and topped off with cupcakes from Sticky Fingers Bakery. 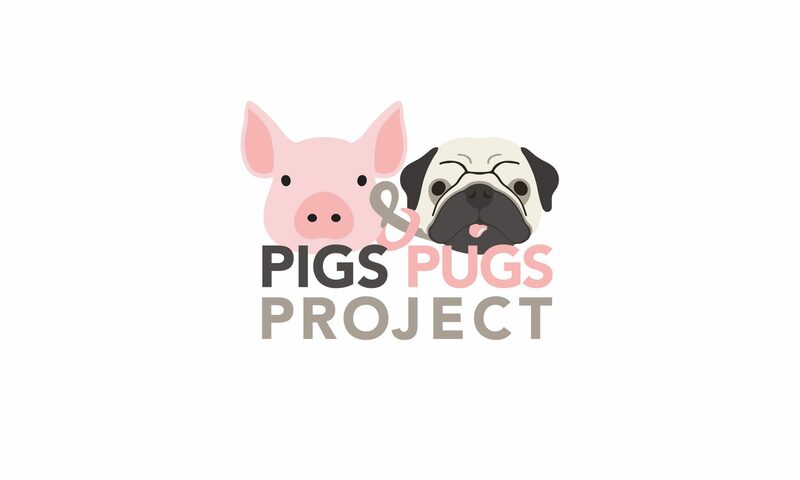 Thanks to you, we raised $1500 for the work of Burleigh Manor and $500 for Tranquil Space Foundation’s new Pigs & Pugs Project. 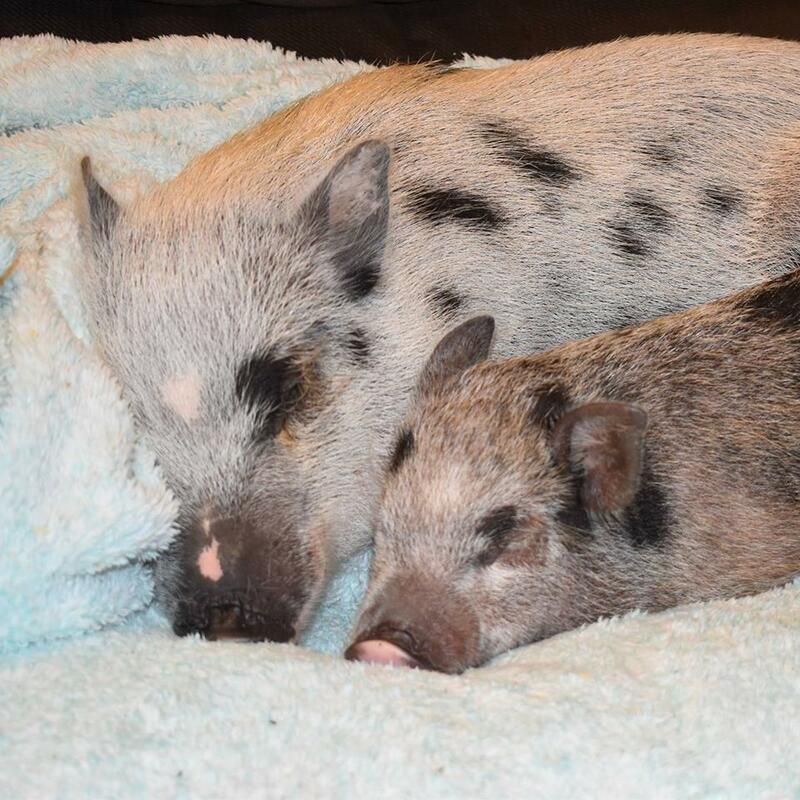 Tranquil Space Foundation used the $500 to support Woodstock Animal Sanctuary’s recent rescue of four sick piglets and their emaciated mother. $500 will cover their medical care for two weeks. We believe all beings should be happy and free. Thank you again for helping support this event and this work!